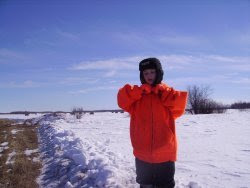 On Monday, Feb. 25th, I took Matt, Louisa, Elsie, and Clara out on a rabbit hunt. Matt, Louisa, and I were the hunters. Elsie and Clara were along just for the fun. We went to some property owned by Rod and Cheryl. 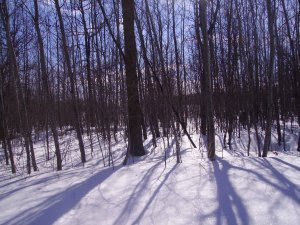 We saw a lot of tracks: rabbit, fox, wolf, sharp tailed grouse, mouse, and even pheasant. Many of the rabbit and mouse tracks were fresh: that is, they were made in the previous 12 hours. But we didn't find any rabbits sitting out and shouting, "Hey, I'd make a great roast!" We moved over to Dean H.'s land. And we found a jack rabbit. 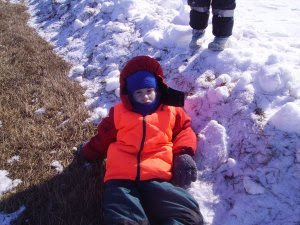 We were really out of shape for hunting rabbits. Clara is lying down here at the edge of the snow in frustration for our missing a rabbit that was only about 5 yards away from us. Matt shot at it with his shotgun. I shot several times with my pistol. We tracked the rabbit to the woods. We saw it and it ran. But Matt, Louisa and I didn't have a good shot at it. So we didn't shoot. So we took to the snow. Matt and I tracked the rabbit for a quarter of a mile. Mostly because tracking it was fun. But we didn't get to see the rabbit again. Matthew was carrying his Remington single shot 20 gauge shot-gun. I was using my Springfield XD-9. For those who are interested, the Springfield XD is a polymer based frame pistol with steel rail mounts. 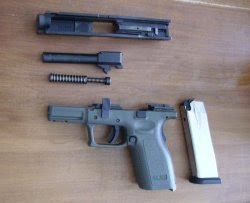 The slide consists of a striker assembly, barrel, and recoil spring. This photo shows my Springfield XD-9 field stripped for cleaning. But on Monday, Feb. 25, it didn't need cleaning. I've been wanting to stop and take a picture of this bridge for quite some time. This is just west of Gonvick, MN. I was on my way down to Lengby and Fosston to see the Staffords and do shut-in visits in Fosston. I remember one day during a summer a few years ago when there was a huge moose standing in this creek. 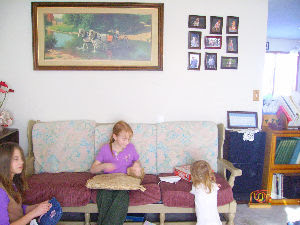 I didn't have a digital camera at that time. Rats. "Hebraism" is the use of a word or phrase in English as if it were the same as in Hebrew. The problem was "behind of photographs." I should have written, "behind on my showing photographs." These photos are from the dinner at Nazareth last Sunday (2/24). 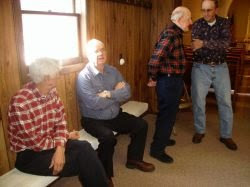 The first is of some old guys talking. They don't mind my calling them "old guys" because they are. But it's nice to be able to sit around and shoot the breeze with members of one of my congregations and community. It helps me as a friend, citizen, and as a Pastor to understand the many things that my members have to deal with. For example: one of the chief topics of conversation that Sunday was the Bovine Tuberculosis problem in our corner of Minnesota. Basically, there are two or three herds in our northern area that are affected. The problem is, as my members see it, the deer population is so huge that it is impossible to prevent the spread of this disease until the deer population is thinned out to a great degree. Now, how does a pastor respond to that? A pastor doesn't respond. But a man who is a citizen of this state and country can respond how he wills. I'm not sure how other Confessional Lutheran pastors see their own role with respect to the civic problems facing their own communities. I know that I do not like the encroachment of state and federal regulation on most areas of life. By the way, the second photo is of people who were at the Nazareth dinner on Feb. 24th. And here I caught some of the women who worked so hard and well in providing the dinner at Nazareth. The two women toward the left of the photo are Betsy and Sarah. They have a flock of sheep. One ewe had quintuplets last year. So, what about the TB scare up here? I wish the DNR would allow us to kill a deer whenever we see one, simply as a pest. More deer are killed by automobiles up here each year than are killed in the hunting harvest. The DNR has brought in sharp-shooters to, as they say, thin the herd. But it is not enough. Wherever my members and our community have cattle (and we don't have any huge feed lots like those in western states) the deer are the primary known source of TB. I should have mentioned that on Monday I took Matt, Louisa, Elsie, and Clara out rabbit hunting at Rodney and Cheryl's and in that area. We are a bit out of practice. We were within 10 feet of a jack rabbit when it bolted. None of us saw it amid the broken up snow chunks. And, despite 7 shots from a shotgun and a pistol, he got away. Wednesday I did some sermon prep for the weekend, held Wednesday School, Lenten Worship, and Bible Study. The kids put on a Soup and Sandwich supper at Oak Park. Mary made the most excellent clam chowder. Oh, Jonah, her chicken rice soup did not have any clam juice in it. I brought home made sauerkraut and kimchi. A lot of people were put off by the aroma of the kimchi. But there were enough takers that half my quart jar was consumed. This batch is pretty good, perhaps a bit too much ginger root. And the texture is not great. I used the Kitchen Aid slicer to do most of the work for me. Really, I'm supposed to chunk the ingredients and pound them to juiciness. The sauerkraut had a fair number of takers as well. After getting the kids to bed I went back to the office to finish off a couple of things. Thursday I took off early to do shut-in visits: Annie, Evelyn, Mildred, Marlow, Joyce, Mavis, Milan, Ethel, Cora, and Helen. Of the batch: Mildred, Marlow, and Joyce weren't home when I stopped by. Milan was doing therapy. Helen was having a difficult time with pain. Evelyn is also in great pain and hopes to have a procedure done on her back that can alleviate that problem. Please keep them in your prayers. I'll try to get the ones I missed and a few others next week. I left for St. Petri a bit early this evening because of the bad weather. The roads were very slick. We had worship and Bible study. The storm was worse going home. About 7 miles from St. Petri I saw a pickup-truck go into the ditch. I stopped to make sure the driver was ok and was able to get help. He looked like he was going slowly enough, but the roads were very slippery. After he was ok, I drove 30mph or slower the rest of the way home. It took more than an hour. After my Dec 14, 2006 drive home from St. Petri on icy roads, I was wary of deer. I got home about 10pm. Everyone was in bed but Stella. She was wrapped in her blanket on the living room floor and whining when I came in. We snuggled for a bit. People who don't have children cannot appreciate how much having a 2 year old hug makes a parent feel. She's asleep now on my pillow. And I'll put her in bed shortly. First, Friday. Mary reminded me that Friday morning we went to Clearbrook to do our taxes. No wonder I didn't remember it. Talk about Freudian repression of memory. But there is a nice thing in Clearbrook. The grocery store has a deli. And the lady that does the cooking there is so wonderfully accommodating to me and my celiac disease. I simply go into the grocery store, pick out a steak, she cleans the grill and grills the steak to my taste with some onions. Yum! Now on to the sad news. Bert G's sister Ella passed away Friday morning. Her obituary is here. Bert is in the hospital with heart trouble. He's down in Fargo. The complications of my own parish schedule prevents me from visiting until Friday (2/29) this week. Please keep him and his family in your prayers. Those of you who read regularly know that Bert's family has experienced a great deal of loss this past year with Adeline's, Wilie's and Yvonne's passing. And Brian W's grandfather passed away on Monday. His obituary is here. I didn't have the privilege to know Herb. I was able to stop by last Thursday. His family are grateful that he didn't have to experience a great deal of suffering and a lingering death. Please also keep them in your prayers during this time. Monday, my so-called "day off", was filled with pastoral phone calls and writing. Tuesday I had a bad pain in my neck and upper back. I confess, I slept in until about 10am. And I was mostly worthless in the early afternoon. My wife, Mary, is such a wonderful trooper. I did manage to finish the dishes on Monday before I went to bed. Today I had worship and Bible study at Mt. Olive. This Lenten Bible study focuses on worship. I'm hoping to finish the study off in a nice booklet that others can use. But the study has a focus on the particular hymnary we use here in our parish. Anyone who uses a different hymnal than the Evangelical Lutheran Hymnary will have to rewrite significant portions of the study to make use of it. Anyway, time for bed. Kim, Barb, thank you for the use of your Suburban while our van is in the shop. I like to watch Mel Gibson's "The Passion" without subtitles. My kids just don't relate. Honestly, I don't remember. I kind-of remember driving to TR with Mary. I suppose we got groceries. It's funny what a person can remember with clarity and what happens to one's memory when that person doesn't think whatever is going on to be important. Saturday I had church at Mt. Olive, Sat. 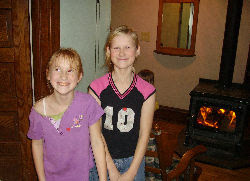 School, and went to Fosston and Erskine for shut-in visits. I had a couple come from the Twin Cities for marriage counseling in the afternoon. Sunday three church services, Communion at St. Petri at 8am, no communion at Oak Park at 9:45, Communion at Nazareth at 11am. A dinner at Nazareth and Joni (Emily's mom, Eli's new grandma) made a special batch of beans for me. Thanks, Joni. I appreciate it greatly. I woke up on Sunday morning with an aura in my (I think) left eye. I knew I was going to have a bad migraine headache. I took the prophylactic dosage of Ibuprofen at about 6am. On my way to my first service it threw up my breakfast on the side of the road. I wonder, in situations like this, what I really am doing or saying during the church service. The Ibuprofen kept the pain away for a while. But the aura in my eye made me miss steps and made me feel off balance. And, yes, it was hard to read. I know that there are lots of migraine sufferers out there. Each church service I had one or more people offering me something that they found helped. So I know that several of my members suffer from this type of headache.. I remember that one time I was just done with the Gospel reading at Nazareth and I got an Ice Pick Migraine. I asked the congregation, "Where are we? I just got a migraine." They told me. We continued. 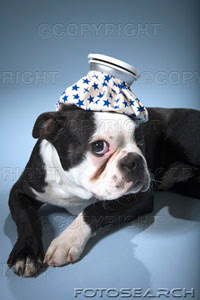 Actually, the best thing for such a headache is a bag of ice on the head, a dark room, and a few hours of rest. Yeah, I mean a bag of ice like those in old James Cagney movies or the "Little Rascals". I was out until supper. And I felt much better. During the dinner at Naz. I started to get the throbbing pain while my Ibuprofen was wearing off. I took some of the Excedrine Migraine pills that were given to me that morning. You know, a headache can make your whole day or even week seem like it was totally un-productive and discombobulated. But I slept well when the sun went down on Sunday. Maybe my migraine messed with my memory of Friday. Maybe not. But I feel better now. And Monday is new! 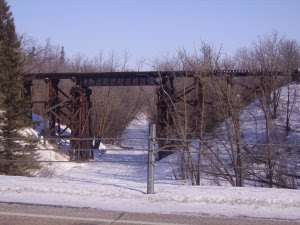 I grew up not far away from Cottonwood, Minnesota. The bush crash there on Tuesday has made national news now. I know one family involved. A schoolmate, Leslie S., had a child on the bus. His child was the last one let off the bus before the crash. 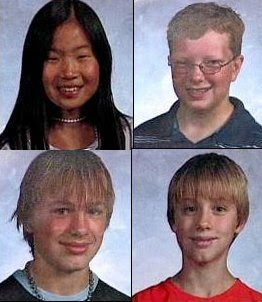 While I am thankful for that, I am deeply saddened at the deaths of the four children. I cannot help but imagine my own kids being helpless in a similar situation. Emily Olson, Reed Stevens, Jessie and Hunter Javens died in that crash. Please keep their families in your prayers. Please also pray for the bus driver and his family, the pickup truck driver and his family, and the young woman who ran the stop sign and crashed into the bus. Our kids had piano lessons today. In view of the tragedy back in my own stomping grounds, I am grateful to God to have my wife and children home safe. We had worship at St. Petri with Bible study afterwards this evening. I made a hospital call in TRF for Herb W. afterward. Herb is the grandfather of my member Brian W. Herb has Emphysema. This disease may take his life. He has also had a heart attack in the last few days. Please keep Herb, his family, and all the others I have mentioned who are facing severe physical trials in your prayers. Corella, thank you for your kind words in your email. Jettie, I didn't really forget about you with the book tag thing. I didn't want to assume that you would want to participate. But since you wrote back about it, ok, you're it. Page 123, the fifth sentence, and the following two sentences of the nearest book at hand. Put it up on your blog, and go ahead and tag as many others as you feel comfortable tagging. Joel, I'll try to call you some time Friday afternoon so we can chat. Thank you for the consideration about Lent being a busy time. But unless I talk with you soon, I will likely become negligent in dealing with your request. Kim and Barb, thanks so much for the use of your truck. I got the parish calender done tonight and sent to the newspapers. Nobody's proof read it yet. Alyssa, there's a printed copy on your desk for the morning. Please make copies for the congregations. We'll be at our tax accountant in Clearbrook in the morning. And I don't have my paperwork done yet. 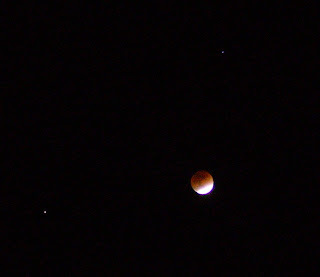 Colder Still and an Eclipse! We had -37F this morning. I got up early to finish off some work on the Bible Study. The day got warmer. We made it up to -8F. 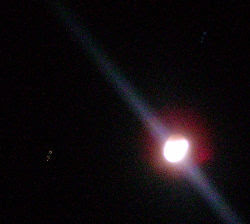 Today there was an eclipse of the moon. I suppose this eclipse will be the most digitally photographed to date by amateurs like me. But the day got warm enough that we had Lenten services at Nazareth. We had Bible study afterward. The forecast was for -17F this evening. 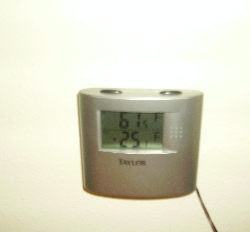 But when we got home at 9pm it was already -24F. It's going to be another cold night. The car almost didn't start when we were getting ready for services this evening. So how did we get the whole family to church with our van pulled apart and in the garage in Fosston? We have very kind and generous members. 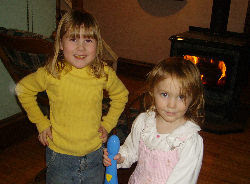 Juel and Anabelle took some of our kids with them to church and home this frosty evening. Thank you so much. 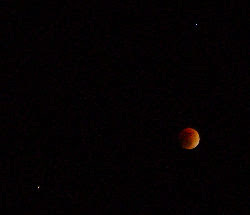 The eclipse started here about 7:20pm, during services. So I didn't get any photos until we got home about 9pm. 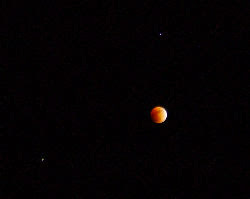 The eclipse was total at about 9:26pm. And about 15 minutes later it started to lighten up. 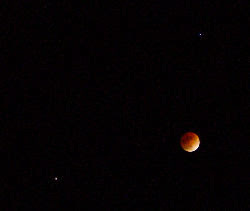 I think that my camera does well in the dark parts of the eclipse. But as soon as there is some bright contrast it cant deal with the brights. But the effect is kind of cool. Tuesday was -33F in the morning. It got up to about -17 by 1pm. Then the temp dropped. We cancelled worship at Mt. Olive this evening. Mary and I did go to the bank and get groceries in the late morning. It was a very cold car ride. 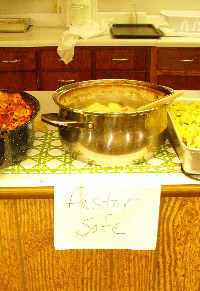 The dinner at St. Petri on Sunday the 17th had two dishes that were "Pastor Safe." One of them was explicitly labeled so I would know. It's wonderful how my congregations work to accommodate my celiac disease. Another member made some gluten-free muffins for me. All the GF dishes were great. The wind started picking up and the temperature was dropping rapidly at about 1pm on Sunday. I left St. Petri for Thief River Falls to do a couple of hospital visits. It was fairly treacherous traveling. 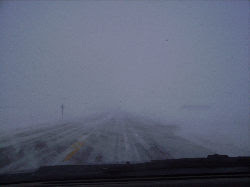 Visibility was down to zero at times. I was hoping that the other drivers also slowed down when they couldn't see. I got to the hospital to see Emily and her new baby Eli. Isaac and Emily gave me an "it's a BOY!" cigar. Lots of family braved the weather to visit them in the hospital. I bowed out after 15 minutes to go visit Milan R.
Milan is doing fairly well. He still has the clamp on his ulcer. 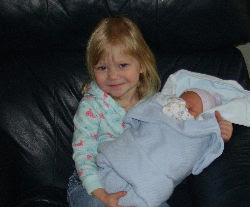 By the way, this is Eli's older sister, Chloe, holding him. She keeps calling him by a girl's name. I can't remember it right now. But its funny to hear Emily and her mom, Joni, correct her a couple of times before she gets the right name. Then, after visiting Milan and having devotion with him on the Forgiveness of Sins in Christ and the Resurrection, I went home through the whistling blistering snow. The roads were really slick. I saw a van in the ditch with a tow truck trying to pull it out on the way home. Just remember 5 miles per hour will get you there. Yes, it's slow. But not as slow as getting stuck. 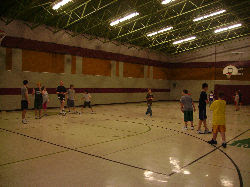 I got home mid-afternoon to get the kids ready for the Presidents' Day Circuit Youth Retreat in Fosston. We had 7 kids from our parish attend. There were going to be a few more, but the Grygla families decided not to travel in the bad weather. We got to Fosston all safe and sound. Kim and Barb, thank you so much for lending me the use of your Suburban. The retreat started at 5pm. We studied various cults, the occult, paganism, wicca, Scientology, humanism, and atheism. The retreat goes from 5pm Sunday to noon Monday. 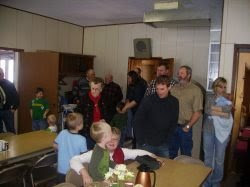 The pastor and kids from Audubon and some of the kids from Ulen couldn't come because of the weather. I went home Sunday night and got up early to get back so I could lead the 7am exercises. 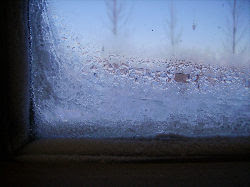 The temperature Monday morning was -25F. On the way home at about 1pm we saw another car in the ditch that hadn't been there when I went down in the morning. Everyone was safe and warm at home in the afternoon. Louisa and Matthew and I slept the afternoon away. Zack, Nitro, Matt, Louisa, Tricia, Jake, and Noah all were excited about the retreat on the way home. The last real post I did was on Feb 8. Well, it's the 20th as I'm writing this now. On Saturday the 9th we had a blizzard. No Church at Mt. Olive. Sunday the 10th was very cold. We have a -20F policy to keep people from going out when they can freeze to death. So, basically, I had a weekend off from services due to weather. I continued work on the Bible Study for Lent as well as a number of other projects in which I am behind. There were several hospital and shut-in visits. Tuesday the 12th we had Lent at Mt. Olive, with Bible study. Wed, the 13th was Wed School, supper, services, and Bible study at Oak Park. 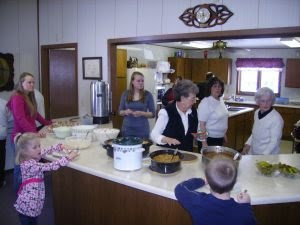 Thursday the 14th, shut-ins, supper at St. Petri with services and Bible Study. Friday I took Mary out for evening dinner for Valentine's Day. Saturday the 16th services at Mt. Olive, Sat. School, a pastoral visit by the Reservation, and a private confirmation class. Home at 6pm. for supper. Sunday the 17th, services at Naz., Oak Park, and then St. Petri with a dinner following. Find the fifth sentence. I don't know what you'd do if you run out of text. Maybe keep turning pages, or even get the next book. I don't think I'll tag five people. It reminds me too much of Amway. line 5 ff on P. 123 of Jonah Goldberg's "Liberal Fascism"
"There was an enormous bipartisan consensus that the Depression required dictatorial and fascistic policies to defeat it. Walter Lippmann, serving as an ambassador for America's liberal elite, told FDR in a private meeting at Warm Springs, "The situation is critical, Franklin. You may have no alternative but to assume dictatorial powers." So who else do I know that has a blog? Quinten and Alyssa--you're it. Last Saturday, Church, Saturday School, attempt at home visit, hospital visit. Last Sunday, church, church, church, a short visit, a canceled visit, an emergency hospital visit in Fargo. Milan had a heart attack. He seems to be doing well. But this is an added complication to his current bleeding problem, a bleeding ulcer in his stomach. They've clamped the ulcer. Maybe I told you that already. I don't understand the process, but it seems to be working. No news through the week on Milan. That means he's doing reasonably well, I hope. Louisa and Clara went with me to Fargo to help me stay awake. There were quite a few concerned family members there. I had devotion with Milan. The girls and I stopped in Hawley at Justy's BBQ. The last time I ate there their Brisket was gluten free. Apparently it isn't any more. We made it home in time before my reaction was too bad. Monday, Gluten reaction recovery. I did read during this time. 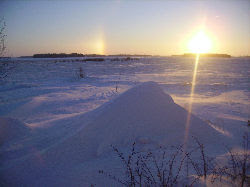 Tuesday, Darrow went down to the hospital in Fargo to have tests for his up-coming chemotherapy. I did some more gluten reaction recovery. It's kind of hard to separate the days right now, but I think I did a visit on Tuesday. Wednesday, some recovery yet, but a couple books I ordered came in. I'm all giddy. The first to arrive was Alister McGrath's "Christianity's Dangerous Idea: The Protestant Revolution-A History from the Sixteenth Century to the Twenty-first. Published by Harper Collins 2007. I'll read this second. "Alister McGrath is a professor of Historical Theology at the University of Oxford." (from the fly cover) That's the Oxford in England, not the Oxford University in America's tornado belt. The book looked promising as a Protestant rather than Lutheran history of how the Doctrine of the Universal Priesthood of All Believers has affected the Christian Church in America. The other book, which came later, is Johan Goldberg's "Liberal Fascism: The Secret History of the American Left from Mussolini to the Politics of Meaning." Published by Doubleday, 2007--and hot off the presses. I'm reading this now. And let me tell you, it harmonizes greatly with my own political/historical research and experience--especially as a professor in academics and as a former student at the University of Wisconsin-Madison. I forgot to mention, Tues eve, church and Bible study at Mt. Olive. Wed. Wed. school, then Worship and Bible Study at Nazareth. The family van has had a problem. It cuts out when we slow down for intersections or stop signs. It was very pronounced Wed eve when I drove the family to Nazareth. Thursday morning we took it to Oklee Cenex for Scott to work on. In the afternoon he called, "Dirty injectors. It's all done. I cleaned them and drove it. It works fine." So we went to pick it up. You know what "Famous Last Words" can mean. Just before we left the Cenex, I asked Scott, "Is it going to blow up on me before I get home?" Just as we got out of Oklee, at the first turn, I heard a bad grinding. I thought it was road noise so I stopped and went around to check the seal on the rear door. It was loose. I fixed that and drove off. Mary had stopped for me. I waved to her to continue. The next turn to the north I heard the awful noise again, and kind-of felt it through my feet. Then the transmission started to fail. I got past the corner and went north about a mile before the transmission failed all together. Well, it didn't really "blow up" on me before I got it home. This isn't Scott's fault. I had no time to deal with it. I had to get to Grygla for Lenten service and Bible study. Mary got a hold of the Nelson boys who graciously towed it home for us while I was off to church. Thursday night. It is amazing how much some broken chunks of metal can make my insides get all wrapped up. I'm afraid that I was a bit jittery and anxious at St. Petri. Sorry, gang. I can be a bit nervous in some situations. I was a bit more worked up about it when I got home. A long drive provides too much time to worry. Friday morning I contacted several places for estimates. I also did a lot of reading today. In the afternoon Aaron C. was gracious enough to tow me in my van to Fosston to Gary's repair shop. The 30 mile tow was intense. 20 feet from the vehicle ahead, connected by a polymer strand, power steering and brakes working, van in neutral, almost 40 mph. It went smoothly. Gary met us after hours. Aaron's baby boy was with for the ride. I had fun with him on the way home playing peek-a-boo and giving him toys and his pacifier. Aaron, thank you so much for the help. This is the second time in 7 years that Aaron has come to my rescue. My first winter here I drove down a road in the winter, bottomed out my all wheel drive van, walked a mile to Arron's place. He put aside his work and towed me out. He also lent me his trumpet. I've learned how to play it, but I'm not very good. I can get the fingerings and the notes, but I don't do it often enough to have good embrochure. That means lip and mouthpiece placement and control. I still manage quite excellently to sound like a grade-school band practice. After I got home Alyssa came over to do the bulletin. Gary will get to the van on Monday. As much as I am in favor of limited government and tax relief, I am now-all of a sudden-thankful for the $1200 family plus $300 per child stimulus package. Because of that the van won't hit us too badly. Well, gotta memorize my sermon for the morning. Church at Mt. Olive, Saturday School, Confirmation, and a family visit in the afternoon. Thursday I had several hospital visits in the morning and early afternoon. I posted what went on a couple of posts ago. 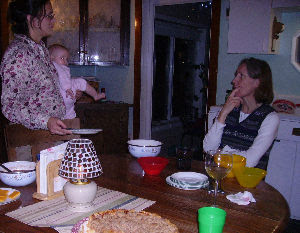 But Thursday afternoon we had set aside for a family get together with Jaime and Laura D's. family. 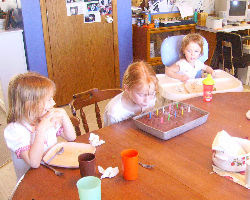 Part of this was Elsie's birthday. Part of it was just the fact that Mary and I want to get to know Laura and Jaimie as friends. I got to their place a little late. They postponed noon meal and were just about to start when I arrived. Elsie and Audrey D. have become good friends. I'm pretty sure Laura is reading this. Laura and Jaime, your home is beautiful and even if you don't think so, it is immaculately kept. The dinner was wonderful. Laura, your kimchi is excellent. And thank you so much for going to the extra trouble of catering to a celiac. Ruth D. and Stella couldn't do enough mischief while we were there. I have to say that Jaime's collection of fire-arms is very enviable. Some day I hope to shoot them all. Alas! We stayed over at Laura and Jaime's longer than we planned. It was a very good visit. We talked about so many important things: Theology, Liturgy, Faith, Children, Family, and our responsibilities as Citizens of the U.S.A. and recipes. Jaime and Laura are Traditional Catholics. That means that they observe the old Latin Mass and the Roman Catholic theology pre-Vatican II. It is refreshing, as a Lutheran, to talk theology with a Tridentine family who knows and understands their theological tradition. It makes a lot of explanation unnecessary and opens so many doors for fruitful theological conversation. But not everyone was involved in the theology. Clara D., our Clara and some of our girls (and all of the boys) were more interested in Snowmobile rides, barnyard chores, chickens, calves, cows, pigs, and computer games. 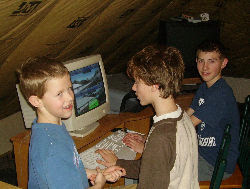 David and Forest D. hid in the attic with Matthew while playing computer games. All of this was last Thursday. So adjust your own reading of this blog to that day. As I posted previously, there were a lot of hospital visits on Friday. Saturday we had worship with Communion at Mt. Olive, along with Sat. School. My home visit confirmand's family had other things going today, so our schedules didn't mesh. I spent some of the afternoon and the evening working on Bible Studies for the parish during Lent. Milan R. is now in Fargo at a hospital there. They have put a clamp on his bleeding ulcer. More than this I do not know, except that his situation is serious. He's in the ICU unit. Please keep him and his family and friends in your prayers. I'll either go down to Fargo or have one of the Circuit pastors see him. Darrow was supposed to get home today. Honestly, I don't know if he did. Nobody called me about his situation. I had a lot of phone calls today. Alyssa (the parish secretary) worked with a few volunteers today for Project Linus. Tournout wasn't as good as last year. But they did quite well. If any of you readers in our area can help out with Project Linus, please let Alyssa know. OK, time for bed. I have church, church, and church in the morning, and a pastoral visit in the early afternoon. Elsie wanted Chinese food for her birthday dinner. Mary made a nice Garden Medley and a pretty good, but not spicey, General Tso's chicken. 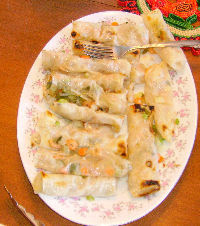 Elsie, Louisa, and I wrapped up 2 dozen egg rolls in rice paper. The rice paper is either rice and tapioca flour, or just tapioca flour. But the sheets of it look like translucent or transparent tortillas. First, you have to get your filling ingredients all ready. We used Bokchoi, carrot, bacon bits, celery, celery leaf, bean sprouts, and shrimp. I put a little fish oil and soy sauce on the shrimp. I'd like to have had some sesame oil, but Mary used the last of that very nicely in the stir-fry dishes. The rice paper is tricky. What we do is lay out a dish towel with three damp paper towels on top. I put warm water on a plate. The rice paper is immersed in the warm water on the plate so that both sides get wet. Then we placed the rice paper tortillas on the damp dish towels and let them sit for a little less than a minute. Then we put the fillings on the bottom edge of the rice paper so that we would get about 4 inches wide. After putting the fillings in we rolled up the bottom edge so that it adhered to the center of the circle of rice paper. Then fold the sides in so that the roll will have a straight edge. Then we roll it up the rest of the way and put it on a plate without touching the other egg rolls. Of course, they weren't really "egg" rolls because there was no egg in them. The next thing to do was to deep fry them. Well, we didn't deep fry. I sprayed them with palm oil and broiled them, turning once, when the first side was starting to brown, and removing them when the second side browned. Deep frying would be better because the moisture in the filling tends to make the egg roll stick to the pan after they've been turned. Elsie had deep dark chocolate cake with off-the-shelf Betty Crocker frosting. I couldn't have the cake because it was wheat flour. But I just had some more of Mary's General Tso's chicken. It was great. Then I had some more of her Garden Medley. It was great. Elsie is a talker. And she had enough wind to blow out all the candles. But the last candle was a bit stubborn. So, Steve and Sarah, make sure one of your boys is stubborn enough to not be blown out! Each of my children have very expressive faces. Their beautiful features all come from their mother. Their ability to contort their faces mostly comes from me. Almost all of that ability, that is. But there is one thing that most of my kids can do that doesn't come from me, but from their mom. 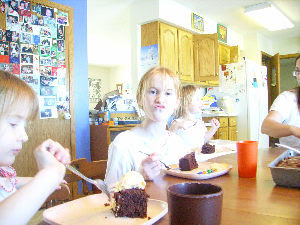 They can move their lips upward, like Elsie in this photo, so that they can seal off their nostrils. I suppose this is some kind of talent or gift. Perhaps it allows them to clear a stuffy nose without using fingers. But I think it's funny. After Dinner we had the gift opening ceremony. Elsie says "Thank you" to all her siblings, parents, grand parents, cousins, aunts and uncles, and Godparents for their kind consideration and wonderful gifts. Of the more unusual gifts she got "Horrible Science, Bood, Bones, and Body Bits," the game "Clue," and on Thursday-when we went to visit our friends, Jaime and Laura and their family, their daughter, Clara, gave Elsie the game "Horseopoly." I suppose the best gift of all is just to be able to say, "I love you." But I had a special gift to test that. Louisa took this picture. Yes, my special--love testing--gift was pickled pigs feet. At first, Elsie took a small bit and hid it in her applesauce. 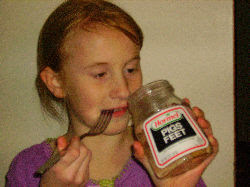 But then she discovered that she liked the flavor of the pigs feet. Most of the kids didn't want to look at the feet. But they did like them. I thought they were too vinigary. I could use a bit more flavor. But Elsie liked them. And I wanted her to have fun on the celebration of her first decade with us. We pray on each birthday: "Thank you, God, for giving us our child and allowing us to be together for these years. Please, if it is Your will, grant that we may enjoy many years together. Bless our child with faith in Christ so that this life will be only a foretaste of the joy that we will share together with You in heaven."